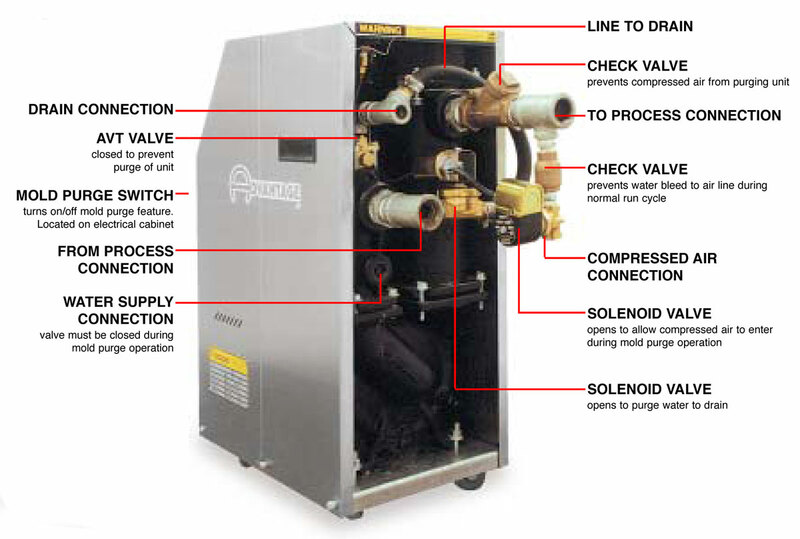 Advantage supplies an optional MOLD PURGE kit for Sentra temperature control units. The mold purge kit contains several solenoid valves and check valves. When activated and supplied with compressed air, the mold purge kit will expel process water from the mold to the central water supply or drain. Advantage mold purge kits are supplied as a factory installed option or a field retrofitted kit. Stop the pump, maintain electrical power to unit. Close the water supply ball valve. Connect a regulated air supply to mold purge compressed air connection. Note: air supply should be regulated approximately 10 PSI above drain line pressure. Activate mold purge with button located on electrical cabinet. When water is purged disconnect air supply. Depress and hold vent button (approximately 30 seconds to release air pressure. Would you like to Download FYI #216 to your browser?